A Trust Deed is a legally binding arrangement drawn up between you and your creditors, available only to residents in Scotland, in which you agree to pay your creditors a percentage of your total debts, depending on what you can afford. It differs from many other financial solutions in that it is much more flexible and affordable and it also provides protection from your creditors. It is designed to enable those who cannot afford to repay their debts a way to establish a monthly repayment schedule based on what you can actually afford. The payment is collected each month by your Insolvency Practitioner who in turn deals with any other considerable assets you might have and distributes the money to the creditors on your behalf. A Trust Deed usually lasts for a period of 3 years, at the end of which any remaining debts are effectively written off leaving you completely DEBT FREE. Remember, a little bit of advice can go a long way. Contact us to see what options are available to YOU. Or have a look at our Trust Deed Frequently Asked Questions. A Trust Deed offers you protection from creditors. Creditor pressure stopped as creditors must deal with us. Can be complete in as little as 1 year if you can offer a lump sum payment. We can setup a Trust Deed in as little as 4 weeks. If your circumstances change, and your insolvency practitioner can’t get creditors to accept amended terms, the Trust Deed is likely to fail. You will still owe your creditors the full amount of what you owed them at the start, less whatever has been paid to them under your Trust Deed. If your Trust Deed fails, your creditors may request that you be made bankrupt. This will always be discussed before your arrangement commences. Your credit rating may be impacted for up to six years from the commencement of your Trust Deed. IN order to set up a Trust Deed, you will need the help of a Trust Deed Provider or a Licensed Insolvency Practitioner or IP. The IP advises you, helps you and puts your Trust Deed Proposal to your creditors. If a Trust Deed is your best option, setting it up is straightforward. Firstly a debt advisor will go through your situation with you, discussing your debts, circumstances, your incomings and outgoings etc... This will help them determine how much your monthly contribution will be to your creditors. If at this stage, you want to proceed, then your proposal is drafted. Your creditors will vote on your trust deed and after this period, if there are no major objections, your Trust Deed will become protected - you will be free from debt in 36 months.
" From start to finish they have been upfront and honest. They have helped me put my life back on track, thanks guys :-) "
A couple were jointly paying creditors over £700 per month. We were able to have this payment reduced to £300 per month, with all interest and charges frozen. 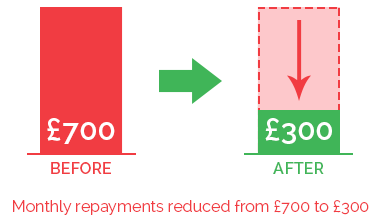 After 8 months of paying this reduced sum, they proposed to remortgage their home. This was successful and they released £19,000. Their creditors accepted this as a full and final settlement of their debts.